Thanks so much for your words of encouragement, Pat. Many thanks for your generous response, Will. Much appreciated as always. Ann~~a tremendously beautiful scene! 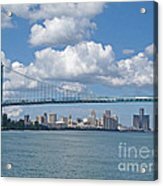 The Ambassador Bridge and the Detroit skyline are superbly composed- striking water and sky, too! Very nice!!! F&V! Thank you, Robert and Donna, for your generous responses. Appreciated as always. Jim, thank you for featuring Crossing the Detroit River in the Comfortable Art group. 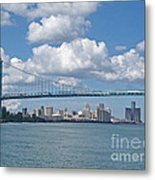 Rachel, many thanks for featuring Crossing the Detroit River in the Michigan Photography- Pure Michigan group. Valerie, Deborah, Lianne, Laurie and Ruth... my thanks to each of you for your gracious response. So encouraging! Thank you very much for your complimentary comment, Latha. Very much appreciated. 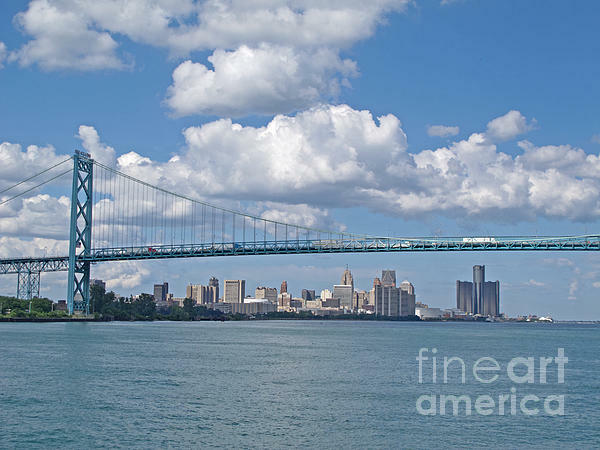 The skyline of downtown Detroit is seen from the Detroit River near the Ambassador Bridge, an international crossing between Detroit, Michigan and Windsor, Ontario, Canada. Copyright 2013 Ann Horn. ALL RIGHTS RESERVED. This copyrighted image does not belong to the public domain and may not be reproduced, copied, altered or manipulated in any way without the written permission of Ann Horn. ann-horn.pixels.com. pixels.com Group Features: Comfortable Art. Pure Michigan Photography- Pure Michigan.